As a Navy man, I believe the best way to do business is with a firm handshake. But as so many of us know, shaking hands is hard to do when your partner is hundreds of miles away. So when an opportunity arises to see our clients in person – as we do when we host a Customer Spotlight – I look forward to the in-person interaction. Not only do we get a chance to learn how we can better help our customers achieve their business goals, but we get to put a face to the email signature and connect in person with longtime partners. Our latest Spotlight featured one of our long-term customers who has given us the opportunity to talk with them under the spotlight on four separate occasions over the years. We have the biggest slice of their direct mail communications, sharing that honor with three other suppliers to mail nearly one billion pieces each year on their behalf. As one of the biggest mailers in their industry, this company understands the importance of not only taking care of customers, but taking care of their partners as well. This customer manages twenty partnerships of their own, making sure that each gets the attention it deserves. They see partnerships the same way we do, as a way to improve your business and accomplish more. In fact, during this Customer Spotlight, our customer told us that one of their biggest focuses for 2014 is on customer partnerships and finding the right ones by meeting their customers in the way they want to be met. Oftentimes, that preference is through mail. However, this customer confessed that they need guidance about how to innovate and make an impact with their target audience. And that’s where our partnership comes in. During the Customer Spotlight, our guests said they are relying on us to guide them on the best way to innovate and communicate with their own customers because we have done both so well with them. Despite having to conduct business over the Internet, where so many signals can get crossed, our ability to communicate has made us an example of how partners should act. More than any of their suppliers, they trust that if we think that there is a way to improve their mailings, we won’t hesitate to talk to them about it and find the best solution. They cited several occasions where we have taken it upon ourselves to help them prosper as both a partner and a business. One memory that stuck out to them was when their IWCO Direct account executive called after hours to alert them that weather could impede their upcoming mailing schedule. 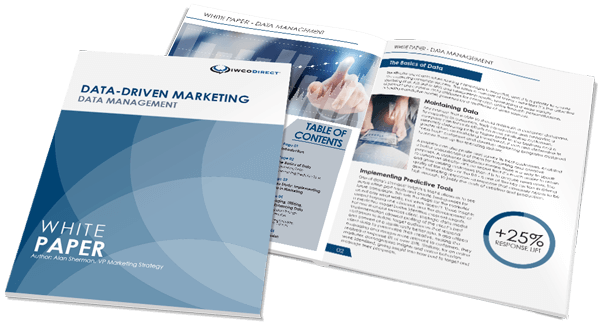 The account executive helped them develop a strategy so that the mail reached their customers at the right time. They listed this as an example of our proactive communication and said that it has proven to them that we really do have their best interests in mind, and that we see their success as our own. So although we don’t get to close out each day with a handshake, we still get to conduct business the way it was meant to be done, with open communication and a clear focus on how we can go that extra step for our partners.